In a delirious stroke of desperation I cooked this up in the final 8-9 hours of the LD42 Jam. Move your crystal thing with Arrows or WASD and avoid walls, which you create by moving. Collect keys, unlock locks and go through portals. Clever, amirite? I really like this, any thoughts on expanding the idea? 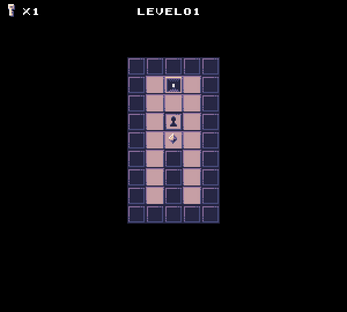 I did actually have in mind to include a level editor that uploads maps to a database for other people to play. Kinda Mario Maker - esque stuff, haven't really went further with it yet, but it's not necessarily such a big job in itself so I might take up on it again.